RCom now offers 1GB of data 3G data at Rs. 156, an increase of about 26 percent. The operator has reportedly slashed benefits on packages by up to 60 percent. Reliance Communications (RCom) has raised 3G Internet rates, though brings it at par with its 2G data rates. Reliance is now offering 1GB of 3G data at Rs. 156. Earlier, it charged Rs. 123 for 1GB data. The operator, however, is still offering 3G at Rs. 123 price point, but only 400 MB of data. For Rs. 246, RCom is offering 1.5GB of 3G data. Users can get 3GB of 3G data for Rs. 492. Back in July this year, RCom had brought down 3G data rates in an attempt to 'beak the 3G entry barrier' in the country. The operator offered 3G data for 1GB at Rs. 123, 2GB at Rs. 246 and 4GB at Rs. 492. “The Company’s 3G network is supplemented by IP back-haul for a superior data usage experience. Further, the Company’s wealth of fiber-linked towers will help carry the incremental traffic that will come in, offering a superior 3G experience,” the operator had said in its release. Also read, Will RCom's aggressive step boost 3G segment in India? Revision in 3G data rates comes shortly after the operator released its quarter results, showing a significant growth in the 3G segment. RCom claims to have 34 million data customers including 9.1 million 3G users – supposedly largest 3G base in the industry. Even as RCom has raised the 3G data rates, prices are still close to its 2G data rates. 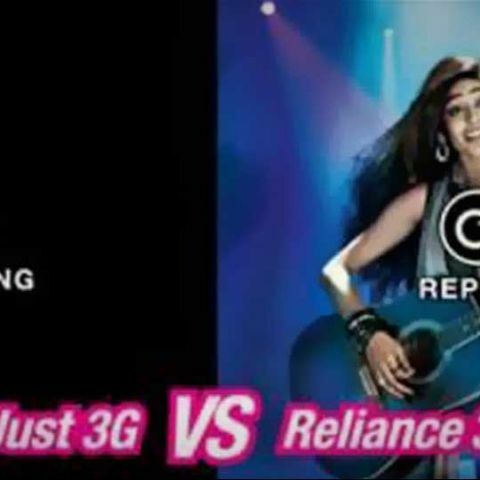 As compared to the rivals, RCom's 3G data rates are still cheaper. Vodafone is offering 1GB of 3G data at Rs. 251, while Airtel is offering the same at Rs. 255.